Arsenal have completed the signing of Denis Suarez on loan from Barcelona with a view to a permanent £20million transfer. 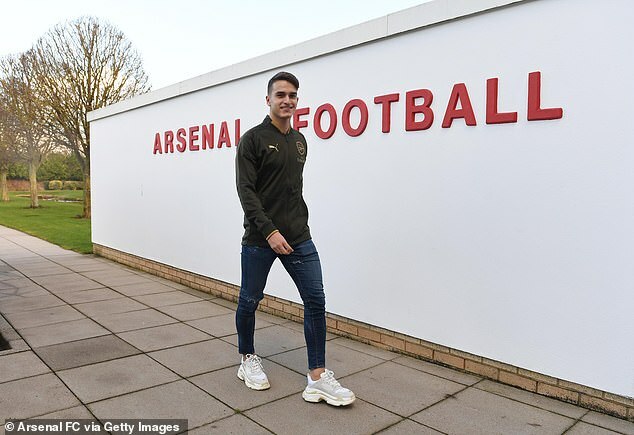 The 25-year-old midfielder, who signed a one-year contract extension with Barcelona prior to leaving for England, has previously played under Arsenal manager Unai Emery at Sevilla, where he won the Europa League in 2015. He will wear the No 22 shirt and could make his debut on Sunday against former club Manchester City. And upon putting pen to paper, Suarez revealed that his admiration for Gunners legends Thierry Henry and Denis Bergkamp have fuelled his excitement to join the London side. 'One thing no one knows about me is that when I was little I used to watch the Premier League on TV,' Suarez said. Suarez arrives with Arsenal fourth in the Premier League due to superior goal difference compared to Chelsea and a two point advantage over Manchester United. A return to the Champions League is imperative for Gunners boss Emery in his first season at the helm, and Suarez has targeted a return for Arsenal via Europa League glory. 'I've come here to play as much as possible and try to help the team qualify for the Champions League. Gunners boss Emery hailed Suarez's arrival. 'We are very happy that Denis Suarez is joining us,' he said. 'He is a player we know well and I have worked with him at Sevilla. Suarez was eager to secure a move away from La Liga leaders Barcelona in January after being left on the sidelines for the majority of their campaign. Barcelona were initially insistent upon him only leaving on permanent terms with his contract set to expire at the end of the season, but his one-year extension protects their investment and helps Arsenal, who Emery said do not have any money for permanent transfers in this window. He has only played eight times for them this season but has scored two and provided one assist. Suarez has played once for Spain, in a 2016 friendly against Bosnia and Herzegovina.